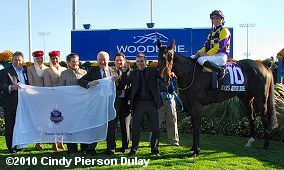 The Canadian International was one of three Breeders' Cup Challenge "Win and You're In" races that were run on Saturday at Woodbine. The distaff counterpart to the International is the $1 million E.P. Taylor Stakes (G1) Presented by Emirates Airline, with a field of 10 older fillies and mares going 1 1/4 miles on the turf course looking for an automatic entry into the Breeders' Cup Filly and Mare Turf. Italian Oaks (G2) winner Contredanse was sent off as the 5-2 favorite off a close second in the Prix de la Nonette (G3). 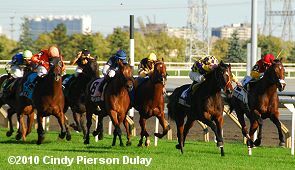 In to challenge her included 3-1 second choice Shalanaya, 7th in the Prix Jean Romanet (G1) last out, and 7-2 third choice Miss Keller off her win in the Canadian Stakes (G2), the major local prep for the Taylor. Jockey Thierry Thulliez sent 5-1 fourth choice Akarlina to the lead soon after the start, and she set slow early fractions of 26.18, 50.93, 1:14.95, and 1:39.24 with 10-1 Mekong Melody and Shalanaya stalking her second and third respectively during the long backstretch run. Akarlina continued to lead into the stretch through a mile in 1:39.24 before tiring, as Miss Keller, who was 7th early put in her run at the 3/16 and gained a short lead over Shalanaya at the furlong marker. 10-1 Reggane, last for the first 6 furlongs, came out wide into the lane and closed with a rush to pass the field over the last 1/4 mile to get the win by 1 length over Miss Keller in 2:03.38 over the good turf. It was another 1 3/4 lengths back to Shalanaya third, while favorite Contredanse was fourth. 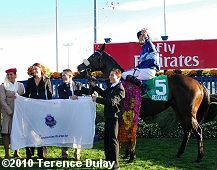 Left: Reggane in the winner's circle with jockey Christophe Soumillon tossing flowers in the air. 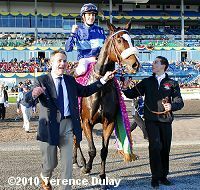 Soumillon said, "I watched her run many times in Europe so I know she is a late finishing filly. She doesn't like to take the lead early. The first turn there was trouble on the inside so I was trying to guard her from that. 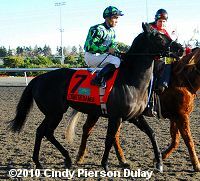 When (Lahaleeb) put me 4 wide I was not really confident but my filly was relaxed. Around the far turn I tried to stay in the middle and she did everything easy." Right: Reggane parades with her flowers after the race. The Alain de Royer-Dupre trainee improved her record to 3 wins, 4 seconds, and 1 third in 12 starts, earning $851,558 for owner-breeder Haras de La Perelle. 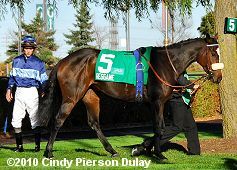 Left: Reggane in the paddock before the race. 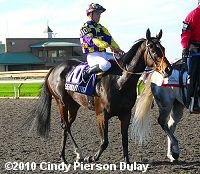 She is one of 102 stakes winners for her sire Red Ransom who died in 2009 at age 22. 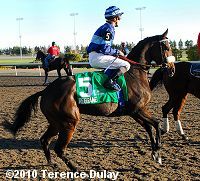 Right: Reggane acts up in the post parade. Soumillon added, "The pace was fast enough for me to wait and when I came into the lane I could tell that many horses in front of me were slowing down so when I asked her to go she gave me a good turn of foot. This was my first ride in Canada and a great moment in my life." 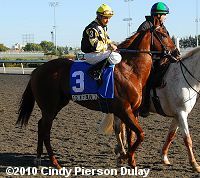 Left: Second place finisher Miss Keller in the paddock before the race. The 7-2 third choice rated in midpack 7th under regular rider Javier Castellano, gained a short lead in midstretch but was unable to hold off the winner. 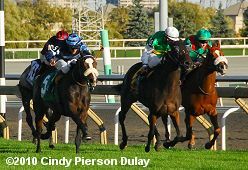 The Roger Attfield trainee improved her record to 5 wins, 3 seconds, and 2 thirds in 17 starts, earning $643,896 for owner Three Chimneys Racing. Right: Third place finisher Shalanaya in the post parade. The 3-1 second choice stalked the pace in third saving ground on the rail under regular rider Christophe Lemaire, bumped with Mekong Melody at the 3/16 pole, and failed to improve position to finish third beaten 2 3/4 lengths. 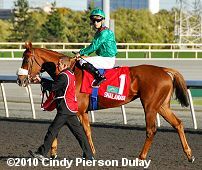 The Mikel Delzangles trainee improved her record to 3 wins, 1 second, and 2 thirds in 10 starts, earning $639,284 for owner-breeder His Highness the Aga Khan. Fourth place finisher and beaten favorite Contredanse in the post parade. The 5-2 favorite raced in 6th early under new jockey Garrett Gomez, launched an all-out drive but finished 4th beaten 3 1/2 lengths. The Luca Cumani trainee has a record of 3 wins, 1 second, and 1 third in 9 starts, earning $362,859 for owner Stuart Stuckey. 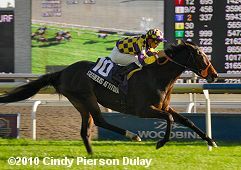 Kicking off the stakes action on Saturday was the $500,000 Nearctic Stakes (G1), a "Win and You're In" race for the Breeders' Cup Turf Sprint. A field of 12 older horses went to post in this 6 furlong sprint, with Bridgetown sent off as the 5-2 favorite off wins in the Latham at Saratoga and the Gilded Time at Monmouth Park. 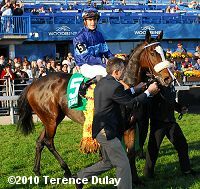 In to challenge him included 9-2 second choice Grand Adventure off a disappointing 8th place finish in the Woodbine Mile, and 5-1 third choice Fatal Bullet off three straight 3rd place finishes including the Play the King (G2) last out. 18-1 shot Sneaking Uponyou battled for the lead with Bridgetown down the backstretch and around the turn through quick opening fractions of 22.98 and 45.69 over the good turf, with Fatal Bullet stalking them in third. Entering the stretch the pacesetters tired, as Grand Adventure rallied to take the lead at the 1/8 pole through 5f in 57.58. 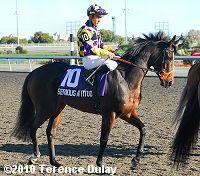 However, 23-1 filly Serious Attitude, who was 11th early, came out wide to sweep to the lead at the 1/16 pole and drew off to win by 2 1/2 lengths over Grand Adventure in 1:09.37. It was another 3 1/4 lengths back to Fatal Bullet third, while favorite Bridgetown faded to finish fifth. Left: Serious Attitude in the winner's circle. Her jockey Garrett Gomez said, "I was down on the inside the whole time. I shuffled my way in there and saved some ground. She always travelled beautifully. When we turned for home, I was eyeing a hole, and I had to hit it pretty quickly. She switched leads, and hit the hole, and continued on about her business, and ran like a real racehorse." Right: Serious Attitude returns after the race. 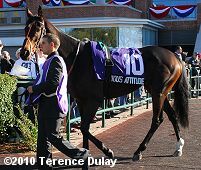 Left: Serious Attitude in the paddock before the race. 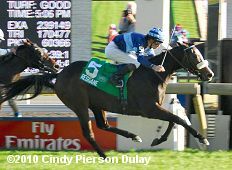 Her trainer and co-owner Rae Guest said, "She was good all year and we knew that she had another great race in her. 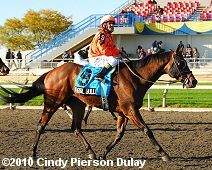 This seemed like a nice race for her because she will be sold at Fasig-Tipton November, so we thought this would be a nice little boost for the sales. I told (jockey Garrett Gomez) that, if he got her in a good position, she would run well. The one horse bumped her but he gave her a great ride. She was nearly last but he got over on the inside, saved ground, sat and made a nice run down the stretch. I thought she was travelling well. I was just worried that she wouldn't find room. I wasn't sure she would win but I knew she had plenty of horse left." Right: Serious Attitude in the post parade. Left: Second place finisher Grand Adventure in the post parade. The 9-2 second choice stalked the pace 2 lengths off under regular rider Patrick Husbands, gained a short lead at the 1/8 pole but could not contain the winner. The Mark Frostad trainee improved his record to 5 wins, 4 seconds, and 0 thirds in 14 starts, earning $720,780 for owner Sam-Son Farms. 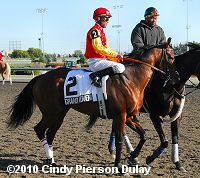 Right: Third place finisher Fatal Bullet returns after the race. The 5-1 third choice stalked the pace in third early under regular jockey Eurico Rosa da Silva, but could not improve position late to finish third beaten 5 3/4 lengths. The Reade Baker trainee improved his record to 9 wins, 3 seconds, and 4 thirds in 20 starts, earning $1,156,510 for owner Bear Stables Ltd.
Left: Fifth place finisher and beaten favorite Bridgetown in the post parade. The 5-2 favorite contested the pace early under jockey Elvis Trujillo but tired in the stretch to finish 5th beaten 6 1/4 lengths. 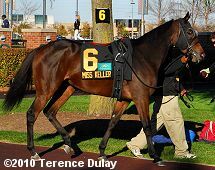 The Ken McPeek trainee has a record of 4 wins, 2 seconds and 0 thirds in 8 starts, earning $515,880 for owner-breeder Eugene Melnyk.